Can I set up and administer an HSA myself? What can I give my accountant? How will an HSA in Canada save me money? Are Health Spending Accounts legal? Given they involve taxes, does it comply with Canada Revenue Agency? Is an HSA effective for an owner/operator/one person business? When will my HSA become effective? What types of health and dental expenses are covered under a Health Spending Account? How long has the HSA been available to Canadian businesses? Are there different types of Health Spending Accounts? How does an HSA compare to a traditional health insurance plan? How do you select an HSA provider? Do I qualify for an HSA even though I have a pre-existing condition? Why are HSAs less common than insurance? How does an HSA claim work? Is there a limit to how much I can deduct? Everyday, I am in contact with Canadian small business owners searching for a cost effective way to pay for their medical expenses. Here's a list of the most frequently asked questions that I receive about Health Spending Accounts (HSA). It covers information on eligibility, comparisons to insurance, how an HSA works, and more. The term Health Spending Account (HSA) can be interchanged with Private Health Services Plan (PHSP). Note: This article is for an owner / operator business with no arm's length employees. If you own a business with arm's length employees, read our Top 24 FAQ about Health Spending Account as employee benefits instead. 1. What is a Health Spending Account (HSA)? 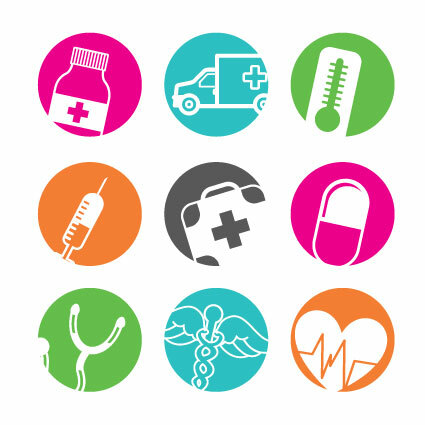 A Health Spending Account is an alternative to traditional health insurance. Used by thousands of small business owners across Canada, an HSA is a special account established to exclusively pay for health care services for you and your family members. An HSA enables a small business to deduct 100% of their family health and dental expenses - without paying standard premiums typically associated with traditional health insurance plans. The ability to write-off health and dental expenses can create savings of more than 30% on medical and dental related expenses. For contractors, consultants, and other incorporated small business owners, this is an effective tool to cut your taxes and reduce your medical costs. You are an excellent candidate for an HSA if you own a business, have medical bills, and pay income tax. 3. How will an HSA in Canada save me money? 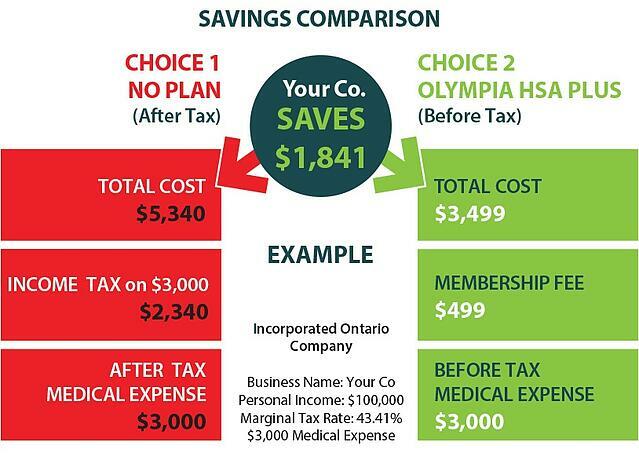 Below is an example of a savings comparison between a medical expense paid personally vs. through your business. The medical expense could represent a year's worth of uncovered expenses that has been paid for by you, personally, with out-of-pocket after tax dollars. After tax dollars is the amount remaining after personal income tax is paid. In this example’s tax bracket, the company will pay $5,340 (including income tax), of which 43% is used to pay income tax ($2,340). To explain in detail, each $1.00 you spend on medical expenses would require your company to pay you approximately $1.78 before tax. The amount of 43% (or $0.78) is paid in tax to Canada Revenue Agency in the form of provincial and federal taxes. In this case, the medical expense is paid through your corporation as a before tax business expense. Effectively, your business is able to write off 100% of your medical expense. You save money by keeping the additional 43% tax inside your corporation. The cost of the Health Spending Account (HSA) will vary by provider. In this example, the yearly (total) cost of the HSA is $499. You would pay $499 instead of $2,340 in taxes. Click here for a more detailed explanation of taxes and medical expenses. 4. Is an HSA effective for an owner/operator/one person business? This category of business includes incorporated consultants, contractors, and professional corporations. This segment of Canada's business community is overlooked by traditional health insurance carriers as it is difficult and expensive to insure. Interestingly, an HSA can be most effective for a one person business. The majority of Olympia clients are owner/operator businesses. By using an HSA, you and your family would benefit from a 100% tax deduction for your family medical benefits. 5. What types of health and dental expenses are covered under a Health Spending Account? One of the great benefits of an HSA is the freedom it provides through the extensive range of eligible expenses. Forget about restrictions. You'll love being able to claim 100% of your child's dental braces. These types of expenses, along with a thorough list of qualified medical practitioners, procedures, and medical devices help make a Health Spending Account an attractive choice for the small business owner. Unlike many traditional insurance plans, an HSA offers 100% coverage on a wide range of expenses...even the expensive ones. Does your son need physiotherapy? Does your spouse need a new pair of glasses? Or maybe laser eye surgery? Maybe you want to get an MRI? Rest assured, all of these are eligible expenses with a Health Spending Account. You can even claim your spouse's premiums if they are a member of a traditional insurance plan. That's right. Premiums contributed to a non-government insurance plan are an eligible expense with a Health Spending Account. How great is that?! Do you have unpaid portions that are not covered from your spouse's plan? Not a problem - the remaining amount of an expense is eligible with a Health Spending Account. Fantastic. Prescription drugs, massage therapy, and hearing aids are all eligible expenses too. If you are traveling to the sun on your upcoming vacation...pick up a pair of prescriptions sunglasses so you can read on the beach (the sunglasses are eligible). Sore feet from that long hike or fishing trip? Pay a visit to your friendly Podiatrist as all of their services are eligible expenses. 6. Are my dependants covered? Dependants are eligible with a few restrictions. 7. How does an HSA compare to a traditional health insurance plan? There are several advantage of a HSA compared to a traditional health insurance plan. Premiums, expense eligibility, coverage, ease of use, deductibles, and claims are some of the areas an HSA is considered more favorable. Understanding the difference between insurance and administration is critical when deciding on how to pay for your medical expenses. Pay for the expenses you incur, eliminating a situation where you have paid into a program that you did not use. Items that you wish to claim under this policy may be restricted by an annual or life-time maximum, or require special authorization in order to obtain eligibility. At the time of enrollment, medical history will be requested and pre-existing conditions may be excluded or reduced from coverage. Under a fully insured program, you will receive a plan booklet outlining the items that are covered, and also the ones restricted or excluded by definition, co-insurance, deductibles, or fee guides. Figuring out your coverage and if it will be reimbursed partially or in full can get complicated. A PHSP is typically only restricted by dollar amount. You will have 100% coverage for all eligible expenses up to your spending account limit. Your account balance is updated by the administrator every time a claim is processed, eliminating the need to keep track of this information manually. There is a limit for the number of visits and treatments. A PHSP / HSA with a digital claims platform will process your claim within 24 hours versus many traditional insurance claims that can take several weeks to process. 8. Do I qualify for an HSA even though I have a pre-existing condition? Yes, you qualify. Pre-existing conditions do not affect your eligibility for an HSA. 9. How does an HSA claim work? The payment from your corporation to the administrator is 100% tax deductible. The reimbursement you receive from the administrator is 100% tax free. See the top 9 FAQ on the claim process. 10. Is there a limit to how much I can deduct? There are several factors that determine the limits within an HSA. A reasonable maximum benefit level for an incorporated business owner is $15,000 per year. If the business has additional employee, the business owner is able to determine specific amounts for each classification of employee (management, full time, etc). 11. How much does an HSA cost? Prices can vary as with most other products. An administrator can charge an upfront setup fee, an ongoing administration fee based on the amount of your claims, a maintenance fee, or sometimes these fees are replaced with a fixed annual fee. Here's an example of the pricing for an HSA that uses a fixed annual fee format. 12. Can I set up and administer an HSA myself? In theory, you can self administer an HSA for your business. You can also do your own accounting, legal work, and website development. The fact of the matter is that time is your most valuable asset and you would need to determine if you have the expertise and resources at hand to properly establish, organize, and maintain your own plan. Are you going to be able to dedicate scarce resources to the administration of your HSA? Strict guidelines and conditions are required to qualify an HSA and ongoing knowledge is required to properly adjudicate claims. In exchange for a small fee to a provider, you can be worry free that your HSA qualifies with CRA and focus your time on your business and more important matters. Moreover, what happens if you are audited and there is a problem with your plan? Having a third party administrator gives you an added layer of protection and signals your HSA is in the hands of an expert that is well equipped in the specifics and intricacy of this financial product. 13. What can I give my accountant? Although straightforward to use, an HSA does require proper explanation and understanding before it is adopted by any particular small business. An HSA directly involves matters of taxation and ultimately some small business owners speak with their accountant for clarification. You can forward this article and guide to your accountant for review. 14. Are Health Spending Accounts legal? Given they involve taxes, does it comply with Canada Revenue Agency? Yes! An HSA is legal in Canada - as long as the guidelines are properly adhered to. To properly satisfy the conditions set forth by CRA, make sure you choose a reputable provider and understand what you are purchasing. 15. When will my HSA become effective? Effective dates for HSAs are an important component for CRA eligibility. An HSA is effective immediately on the day you join and cannot be backdated to the beginning of your fiscal year. There are no waiting periods. 16. How long has the HSA been available to Canadian businesses? 17. Are there different types of Health Spending Accounts? Once you get past all the marketing, an HSA is a contract. Specifically, it is a contract between an employer (a business) and an employee. The conditions of the contract should outline the relationship between the employer, employee, and the administrator. So in that sense, all Health Spending Accounts (HSAs) are the same. However, there are some key conditions that will affect the HSA. Are there arm's length employees? What type of compensation does the owner receive (dividends)? Are the employees part time? As a plan with tax planning components, an HSA adapts to the company structure. 18. How do you select an HSA provider? For the most part, HSAs are marketed and administered by reputable firms with a proven and documented track record. Unfortunately, the industry is unregulated and there are no barriers to entry. Make sure you dig beneath the surface and find out the warning signs of a HSA provider that is cutting corners. 19. Why are HSAs less common than insurance? Large providers of traditional health and dental insurance in Canada are very adept at marketing. In fact, they are so effective at developing and delivering targeted messaging that many small Canadian business owners firmly believe that purchasing traditional insurance is a must to effectively protect themselves and their families. The truth is that there are viable alternatives to insurance. Keep an open mind! A Health Spending Account is a tax plan in the nature of insurance. It feels like insurance since it deals with medical costs. The critical difference however, is that by paying for medical expenses through an HSA, you are self-insuring. There are significant advantages to paying for medical expenses through a tax plan instead of an insurance plan.